Betsy and I visit Mt. 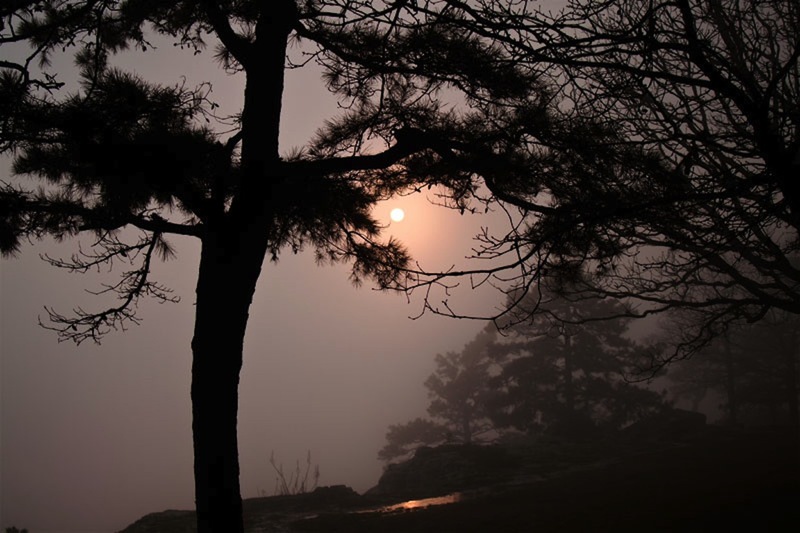 Nebo State Park in Arkansas early each year. We have many reasons for continuing to go there: a beautiful little cabin that we get each year, gorgeous sunrises and sunsets, a peaceful and quiet atmosphere in which we can relax and enjoy each other’s company, and beautiful views. Another thing we do its hike along the Rim Trail, which circles the mountain top just below the rim. We don’t always hike all the way around the mountain, but we do cover most parts of the trail while we’re at Mt. 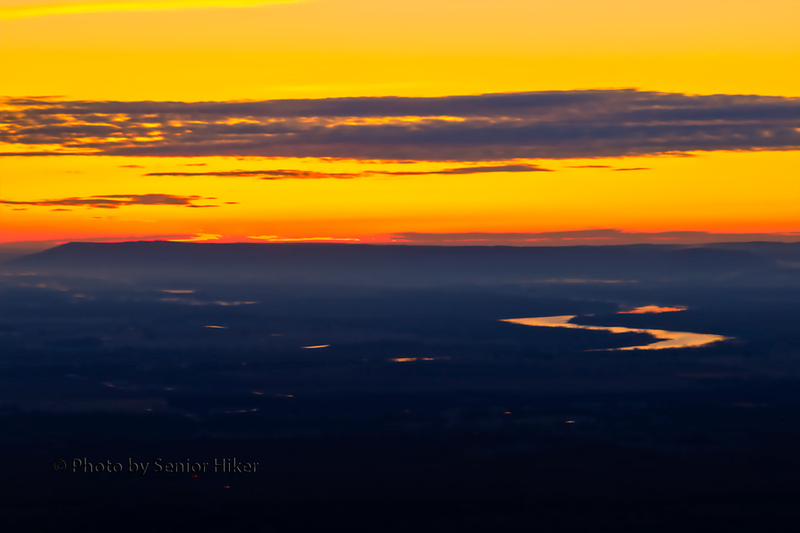 Nebo. There is access to the Rim Trail near our cabin, and the views beckons us each morning, as can be seen in the picture above. On a clear day we can see Mt. Magazine in the distance, another favorite place we like to visit. When we hike from the cabin toward Sunset Point we pass this gnarled old tree standing guard along the trail. 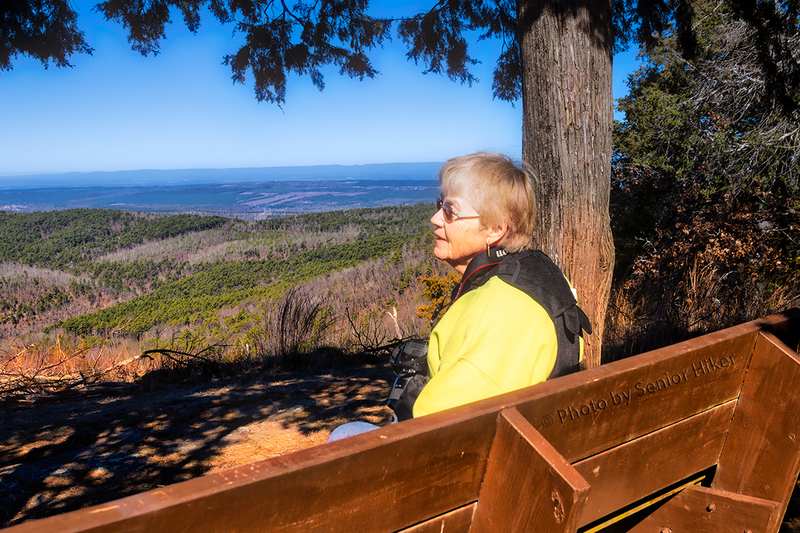 With all the beautiful views along the Rim Trail there are times when we just have to stop and soak them all in. Mt. 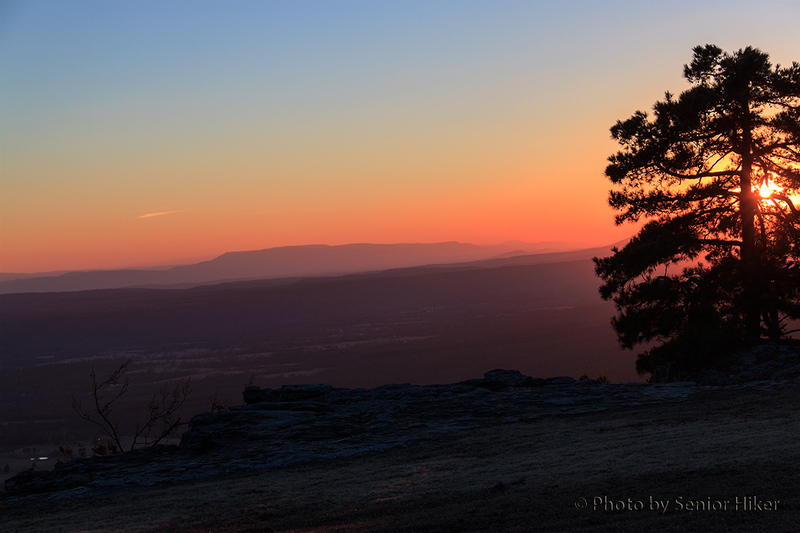 Nebo State Park in Arkansas in one of the favorite places Betsy and I visits. We go there every year, usually in mid-to-late February or early March. 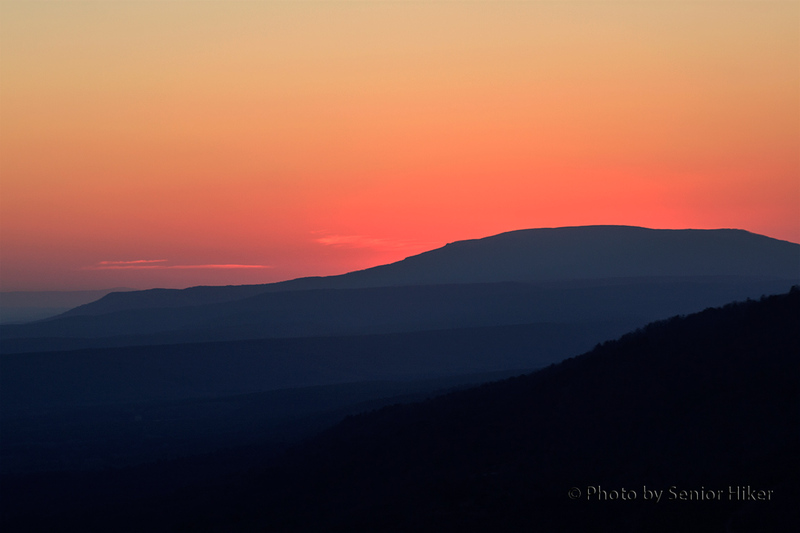 We have several reasons for going to Mt. Nebo that time of the year. One reason is that our favorite cabin is usually available. There are very few people around, so we feel as if we have the mountain top to ourselves. 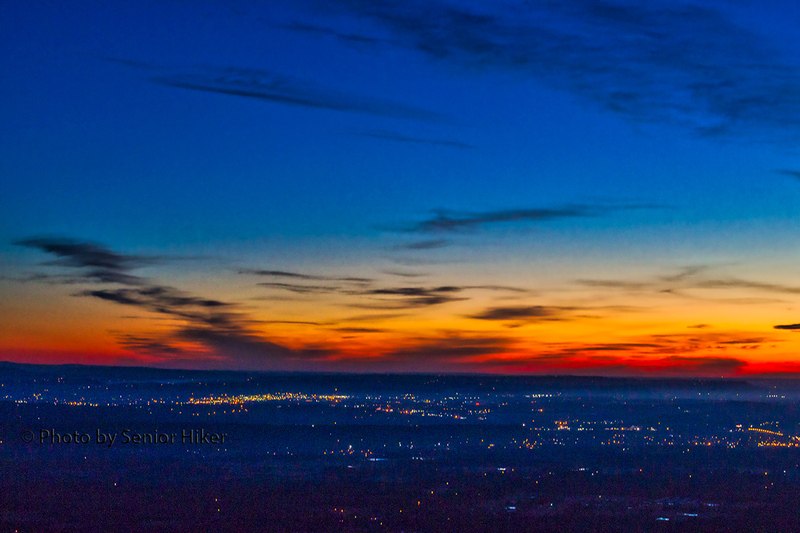 Finally, that is a great time of the year to view both sunrises and sunsets. 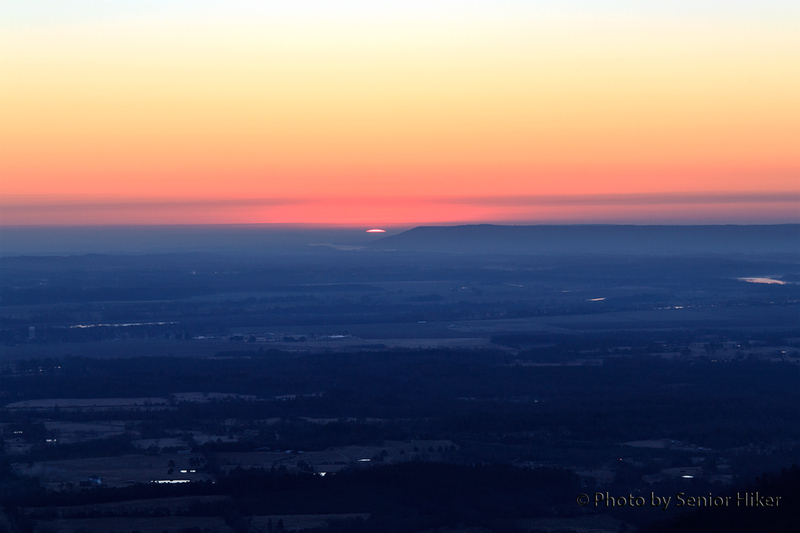 The picture above is the view from Sunrise Point just before the sun poked above the horizon. 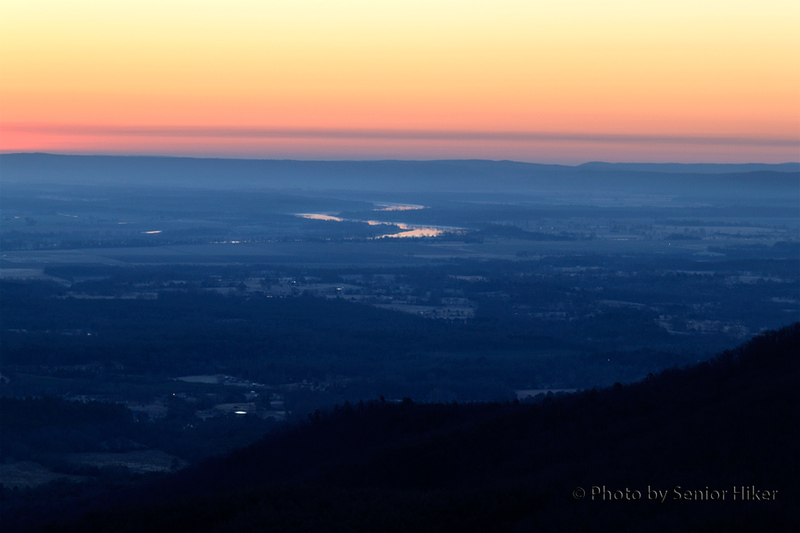 We have to get up early to get to Sunrise Point before dawn starts to break, but although it is sometimes hard to leave a nice bed, the view is worth it — even while the world is still sleeping. 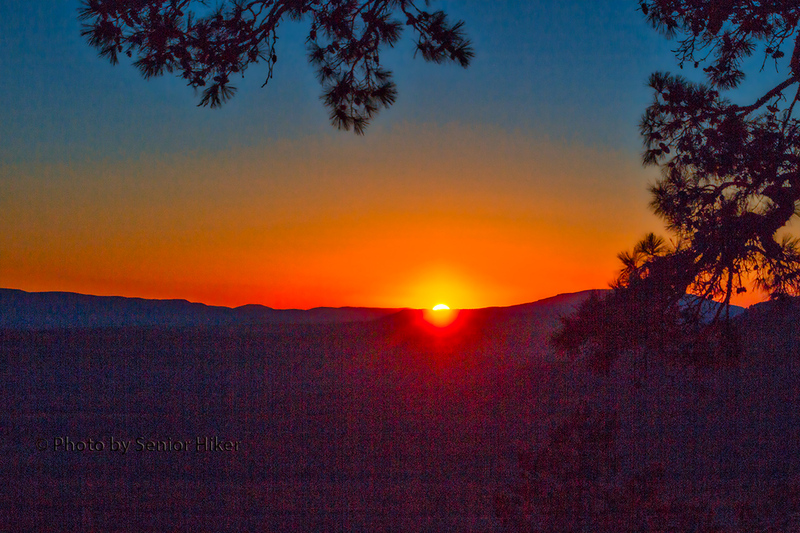 We have a perfect view of sunsets from the back of our cabin, as the photo above shows. 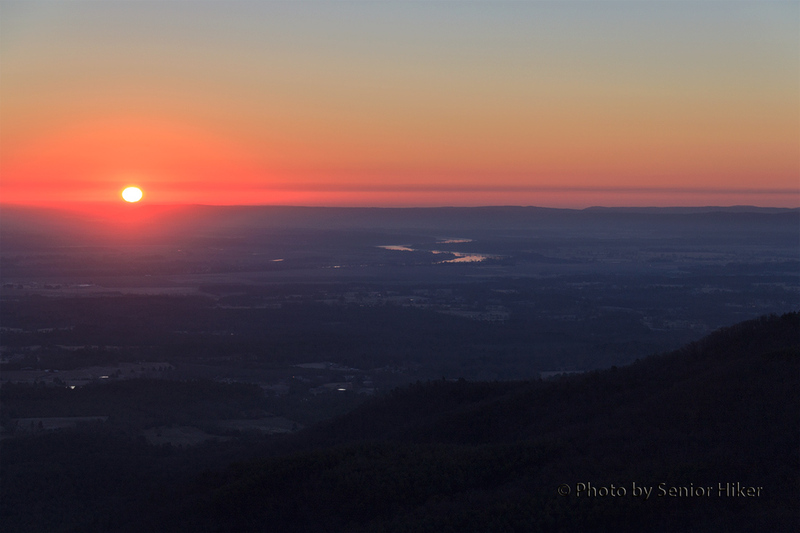 This was taken on a perfectly clear day just as the sun slipped below the mountains to the west. Clear days can give amazing sunsets, but an overcast day has it’s own special beauty. This picture was taken on an afternoon when we didn’t see much of the sun, but there was no doubt that the heavens were declaring the glory of God. Is it any wonder that this is a very special place to us? Betsy at Signal Hill, Mt. 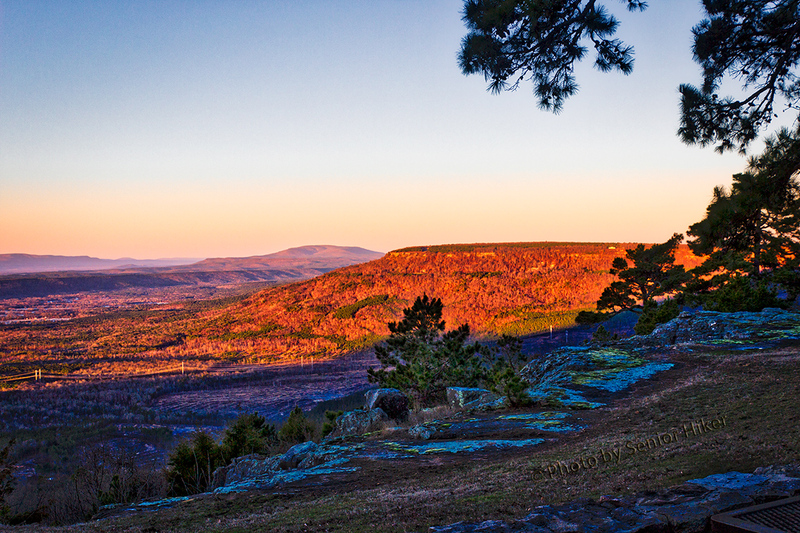 Magazine State Park, Arkansas. February 26, 2014. This is my post for the Our World meme. This meme is a second generation of My World Tuesday created by Klaus Peter and is hosted by three wonderful ladies. To learn more about our world or to join and share your part of the world, click HERE. Betsy and I have been going to Mt. 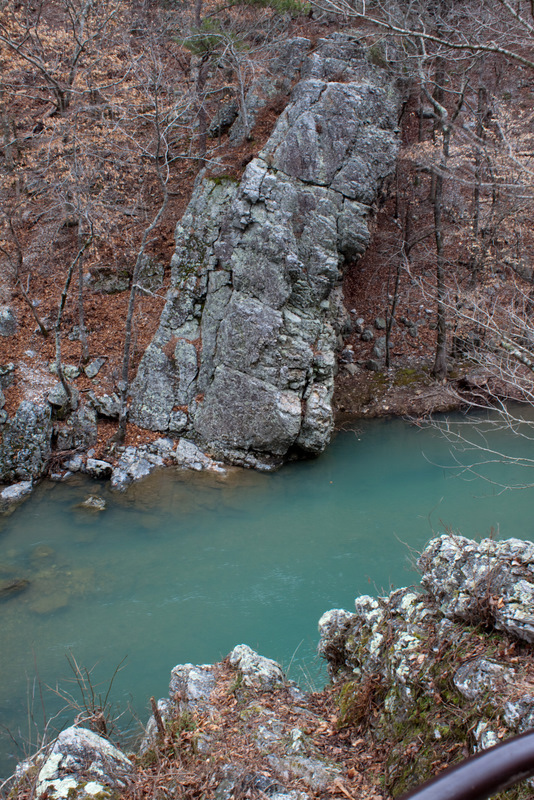 Nebo State Park in Arkansas for several years. 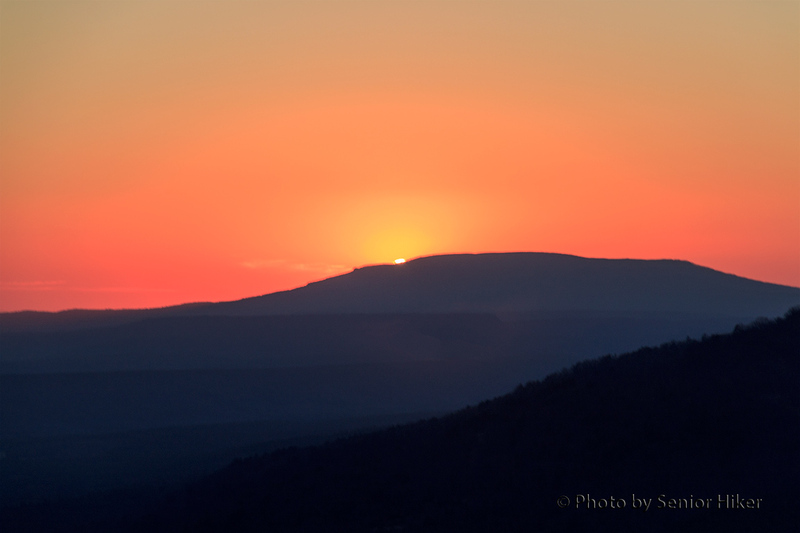 We love ‘our’ cabin on the rim of the mountain and the gorgeous views of the setting sun we get from the back porch. 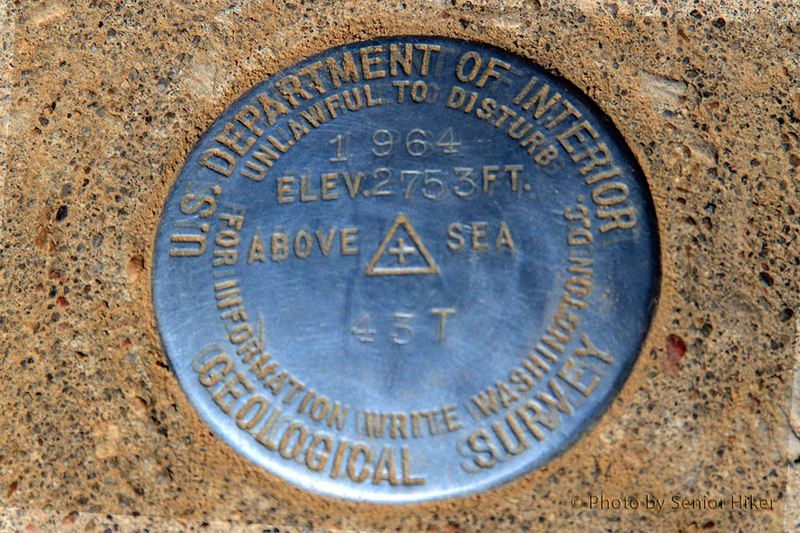 Geological marker on Mt. Magazine. February 26, 2014. But we almost always make a trip to nearby Mt. 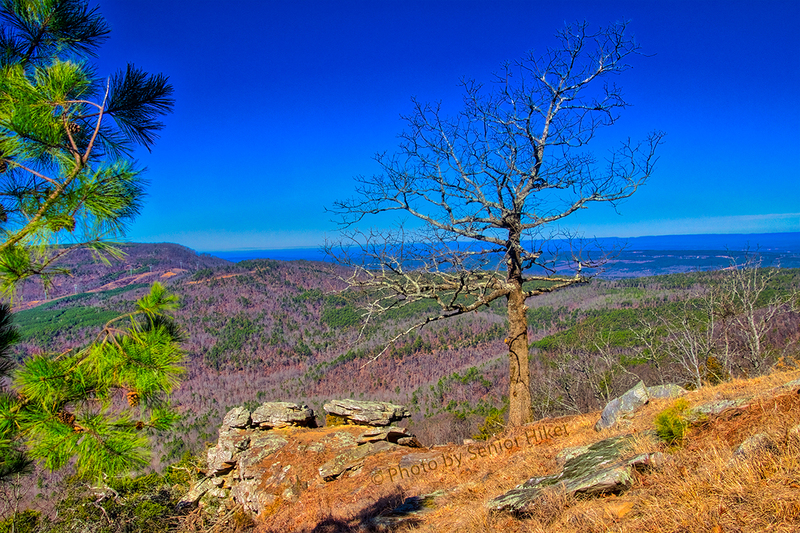 Magazine State Park to enjoy more mountain views and to do some hiking. Mt. 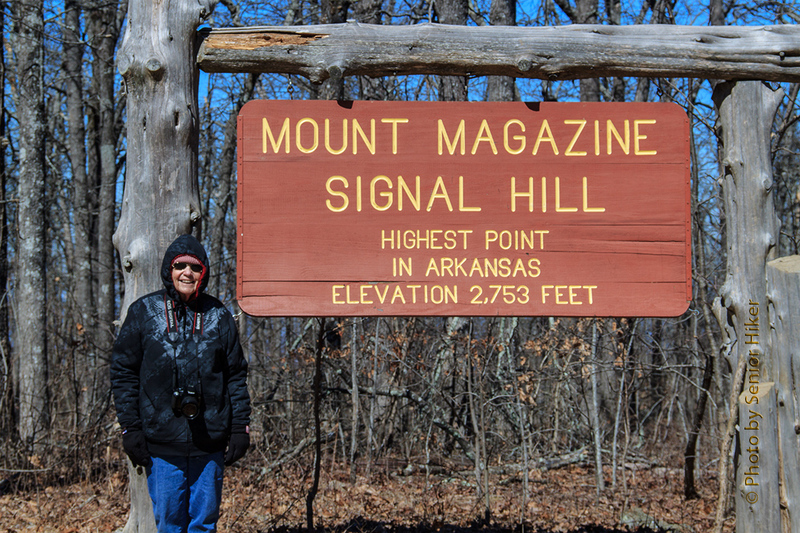 Magazine is the highest point in Arkansas, and we’ve hiked to Signal Hill, the highest point, several times. 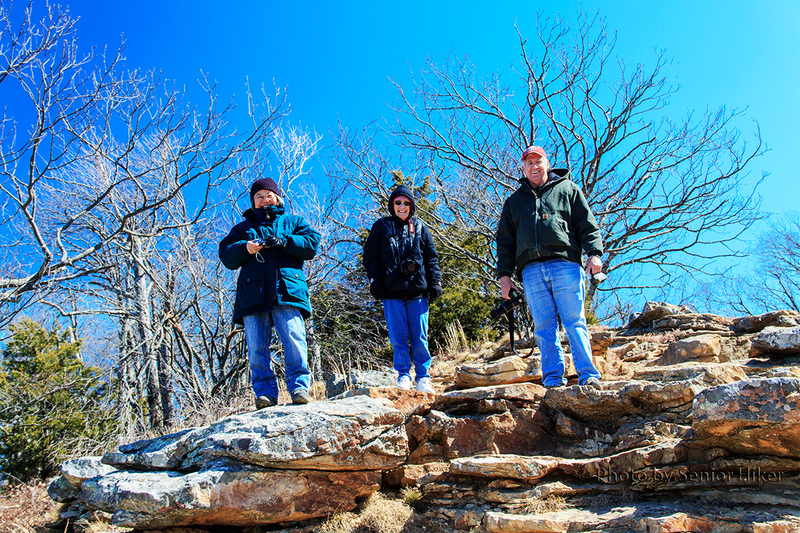 Patti, Betsy and Neal at an overlook on Mt. Magazine. February 14, 2014. This year we were able to share Mt. Magazine with our friends Patti and Neal. In addition to hiking with us to Signal Hill, they also enjoyed the views from some of the overlooks around the mountain. ‘Our’ cabin on Mt. 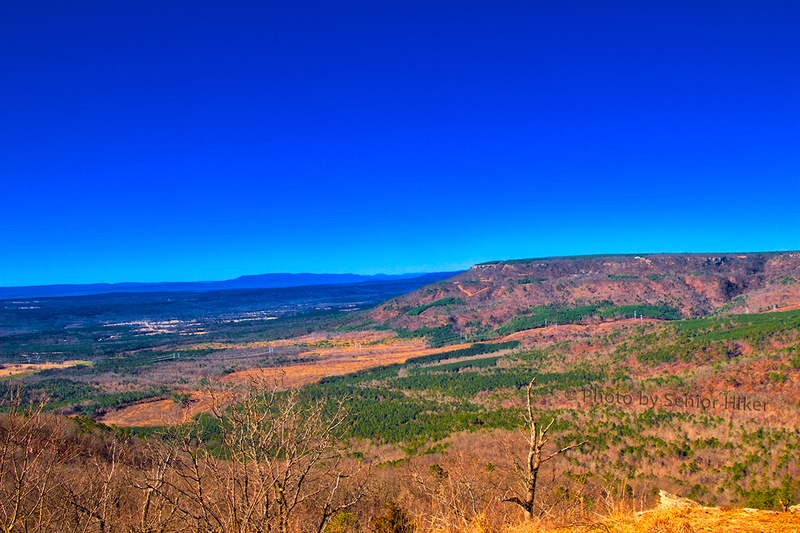 Nebo, Arkansas. February 26, 2014. By now most of you know that Betsy and I visit Mt. 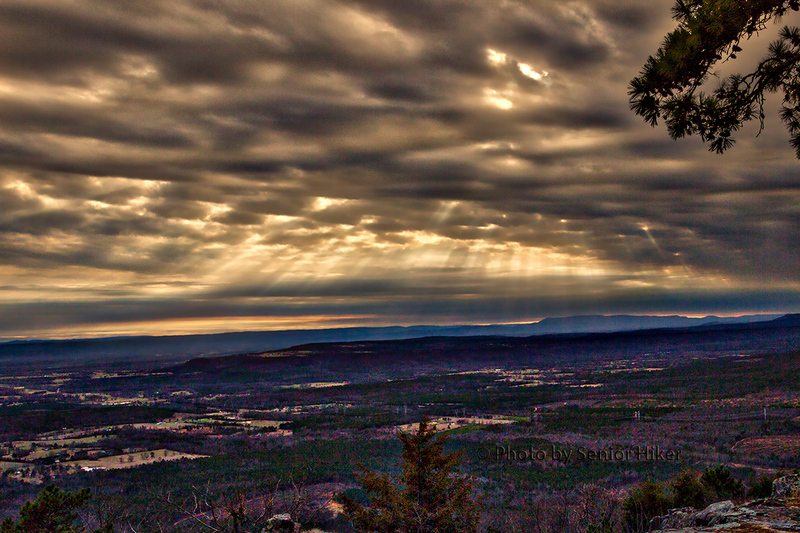 Nebo State Park in Arkansas every year. Betsy knew about this place before I was in the picture, but It didn’t take her long to introduce me to Mt. Nebo. We stay at the same cabin each time we go. 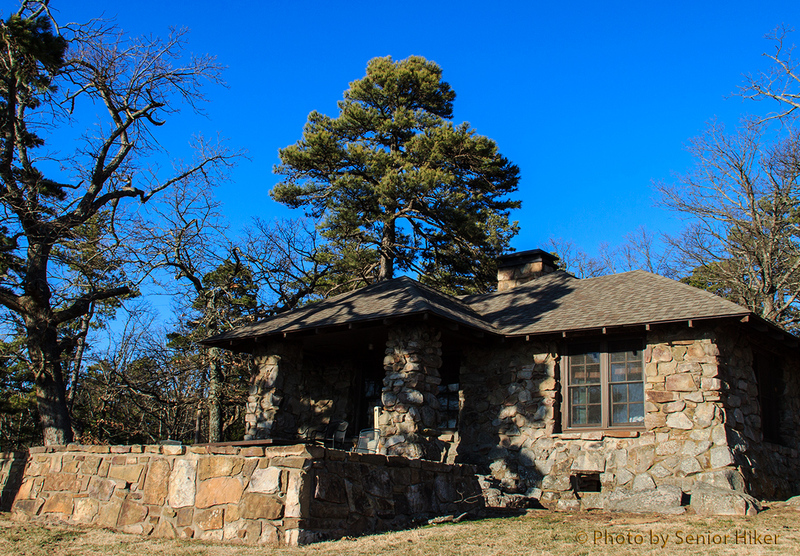 ‘Our’ cabin is a one-bedroom stone cabin built by the CCC, although it has been renovated since then. The cabin has a small but well-equipped kitchen, and the main room has a marvelous fireplace which we enjoy very much. The back of ‘our’ cabin, Mt. 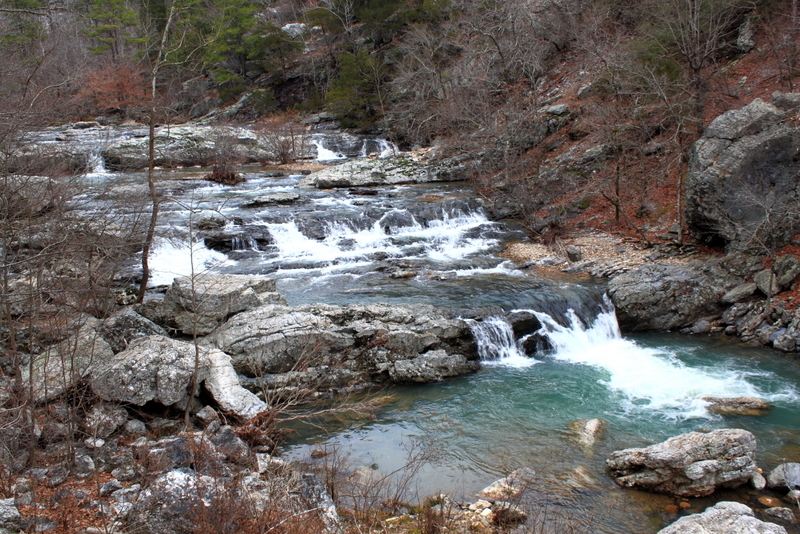 Nebo, Arkansas. February 27, 2014. The cabin sits near the western rim of the mountain. It has a small porch in back as well as a patio with a picnic table. We don’t use the picnic table much since it’s usually still winter when we visit. ‘Our’ cabin in the light of the setting sun, Mt. Nebo, Arkansas. February 26, 2014. 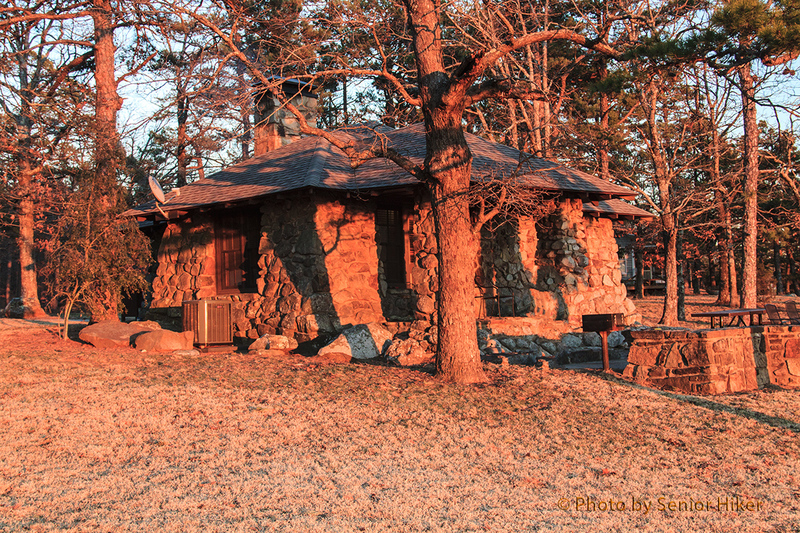 The cabin is perfectly located for enjoying sunsets in February-March, when the light of the setting sun bathes the cabin in a golden glow. The back of the cabin gives us a grandstand view. Dierks Lake, Dierks, Arkansas. February 27, 2012. 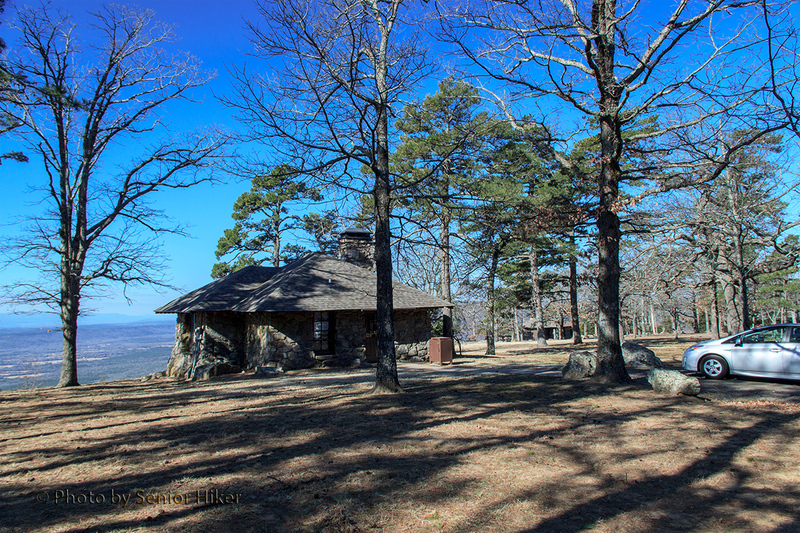 As many of you know Betsy and I have been going to Mount Nebo in Arkansas for almost as long as we’ve been married. 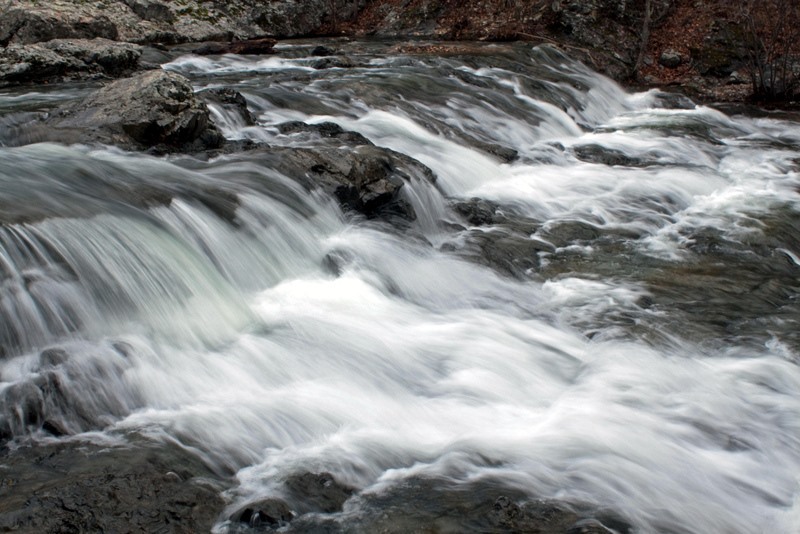 We usually try to find some waterfalls to visit, but we visit other places that capture our interest as well. Last year we met a man as we were coming back to the car after visiting a waterfall in Arkansas. He recommended that we continue a little farther down the road to Dierks Lake. We were glad we took him up on his suggestion. 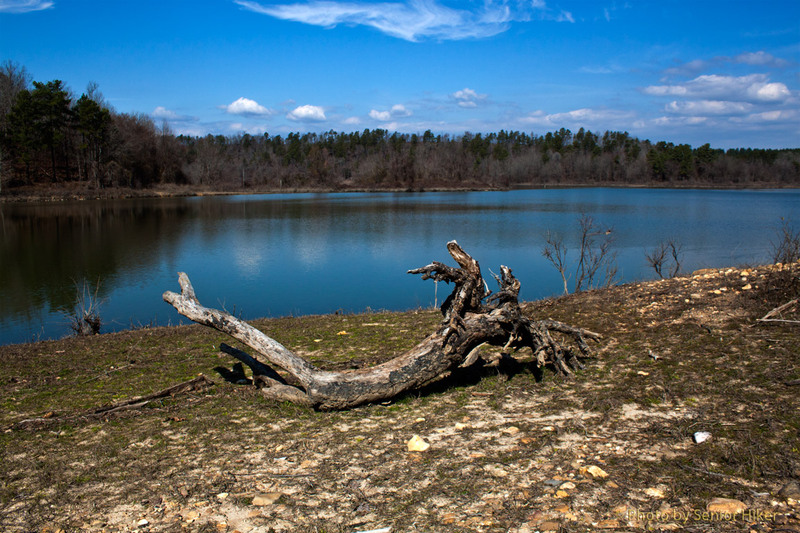 Dierks Lake was formed by a dam across the Saline River. We’ve been told that it’s noted for largemouth bass fishing, but we just enjoyed the beauty of the lake. Betsy has a new photo blog, which I’m sure you will enjoy. You can find it by clicking HERE.